Are you tired of running out of things to say on a date? Would you like to be able to approach new people and start conversations quickly and easily? If so, this short book is exactly what you need to guarantee your conversation never runs dry. Written by the UK's top Dating Coach and Dating Expert , James Preece, you'll learn the secrets of exciting discussion subjects and what singles really want to talk to you about. You'll discover simple ways and conversation starters to ensure you always have something fun and useful to talk about. This will ensure you get a second, third date and ultimately a relationship. You can make sure they are really listening and read their body language to tell if they are interested or not. There's even a section on speed dating which is a fantastic opportunity to practice your new found skills. 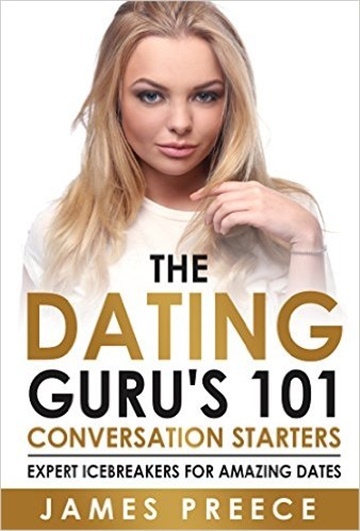 However, the best part of the book is the 101 Ice breaking dating questions that you can use to stimulate your conversation. He is an internationally renowned Dating Expert and Dating Coach and the best-selling author of "I Will Make You Click." .He is a very experienced Relationship expert and is a rising star having already helped thousands of men and women find love, build confidence and improve their relationships. He has been a featured expert in top UK and international media: such as the Independent, Cosmopolitan, FHM, Men's Health, Match.com, The Sun amongst many more. He also runs very successful dating events both in the UK and is a regular consultant for many dating companies.He has advised for various television and radio shows including the Online Dating episode of "You've Been Scammed" for BBC One and Channel 5 news. "The questions are a bit like psychological profiling, but are actually very clever for the person asking the questions if they know how to work someone out from them"